Uber driver Tom Vandel teamed up with artist Karen Wippich for an illustrated insider’s look into life behind the wheel. Since Uber’s arrival in Stumptown, Portlanders have been merrily hopping in and out of the ride-hailing behemoth’s cars (occasionally accompanied by kittens and flu shots). Freelance copywriter Tom Vandel saw this as chance to live out his desire to see the world through the eyes of a cabbie. Then he decided to dish on the experience. 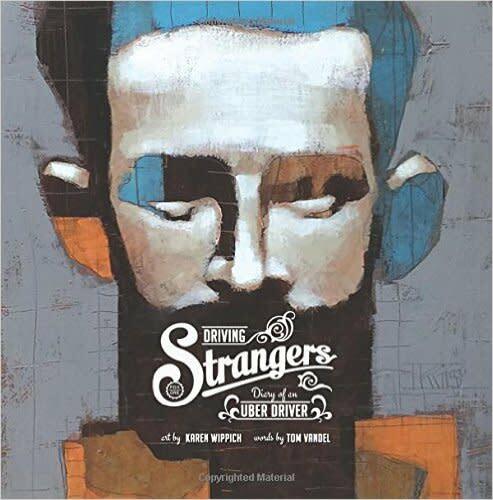 He paired with graphic designer and artist Karen Wippich for their book Driving Strangers: Diary of an Uber Driver in which they pair anecdotes from Vandel’s experiences—passenger interactions peppered with Vandel's occasionally insulting, often inappropriate, and always unfiltered reflections—with portraits by Wippich. We chatted with Vandel about the highs and lows of driving around town. You reveal some pretty specific details about rides and your interactions with passengers in your book. How can you recall so much? From my very first ride I thought I would take notes on every ride not knowing how long I would do it for. At one point I thought I might do a blog about it. I have index cards in my car and when I drop somebody off I write down their name, the total fare and the rough details of the ride. If there were something particularly interesting about the person—for example what they were wearing—I make note of that. "Katya: Born in Russia, she moved here as a kid. Now married and living in Portland. Husband works for Nike. Took her from condo to PDX. Wants to go to Russia with grandparents but having trouble renewing passport. Hates Vladimir Putin. I ask why. Because he's corrupt and he takes his shirt off too much. I gotta agree. I hate bare-chested leaders." Do your passengers know that you are keeping notes? For the most part yes, although I don’t always say something. Now I tell them I’ve written a book about it and they are generally receptive. I let them know I change all the names in the book. How did the collaboration with Wippich come about? She’s been doing these portraits for a while, and she was the one who had the idea for doing this book. She approached me with her portraits looking for a way to showcase them. She knew I was compiling these stories. I edited the stories and she would pair up a picture with a story she thought was fitting. She designed the book and found the producer. Did you decide to become an Uber driver to supplement your income or was it more of a social experiment? Definitely more of an experiment. As a freelance copywriter I have a very flexible schedule. I have always thought being a cab driver would be a cool thing to do, you know, just for fun but I never had the chance to do it. When Uber announced they were coming to Portland, it took me a little while to get all my ducks in a row but once I did, two days after the city approved me I was driving for Uber. Was the money any part of your motivation? At first I wanted to see how much money you could make. Some guys were saying, ‘Oh, I’m making $25-28 an hour.’ I eventually found out that you don’t make that much after you account for your own gas and the depreciation of the vehicle. I quickly learned it wasn’t a moneymaking venture and that it was more interesting to meet people and see what they are up to. I especially like taking people to bars. Customers are probably chattier coming out of bars. Yeah (laughs) that’s true. Usually I don’t drive too much at night, it is generally crazier. What kinds of questions do you ask your customers? I’ll say, ‘Here are your three choices: Either I’ll be totally quiet; we can have an interesting conversation; or if you have a personal issue, bring it to me and I’ll help you with it.’ Sometimes if something is bothering someone, talking with a stranger who has some life experience is a good thing. Are your customers usually open to your conversational gambits or are they standoffish? It’s both. I can tell right when they get in the car. I might ask a question right up front to see if they are up for a conversation or to find something we both have interest in. Other times I can tell they are busy in which case I’ll stay quiet. I play it by ear. Do you think you are perceived differently when you are working as an Uber driver than when you are working as a copywriter? Yeah, yeah I think so. As a copywriter they know I have a certain amount of professional expertise. When you’re an Uber driver they assume you are just doing it for the money and don’t give you as much respect. What is the craziest experience you had while driving for Uber? There was one time I drove five people even though I’m not supposed to have that many. Three women got in the car and said, ‘Wait, we have two more guys coming!’ It was downtown at 2am. So they all got in and I realized, ‘Oh my God, there are five and they are sitting on each other’s laps.’ They wanted to go clubbing but one of them had forgotten his ID so I drove them back to Lake Oswego. Another time, a group of customers wanted to know if I was interested in sharking some of their spliff. . .
Driving Strangers: Diary of an Uber Driver is currently for sale on Amazon.